A big thanks to The Eco Chic for allowing me another week to guest post. This isn’t something The Eco Chic would normally blog about (added by The Eco Chic: actually it is a topic I’m well versed in) — this topic is more of something I have decided to educate myself about to be as healthy as I can be and a better consumer. As always I encourage your thoughts and comments. As I mentioned in a previous post, I’ve changed the way I buy stuff. I don’t go to the store and stock-pile anymore. Not so long ago, I prepared for a hurricane when it was just a wave off of Africa. I am SO NOT KIDDING. In my mind, preparing = buying. I realize now that since we live on the water, if a hurricane is coming, we are out of here and I’m not going to worry about taking my 67 cans of stock-piled soup with me. In the past, when we didn’t get a category 4 hurricane direct hit (thank God), my stock-pile of stuff would expire and I would throw it away. My new way of living has gotten me thinking about other areas of my life that could use modifying and after reviewing my habits, I realized something very scary. Before I walk out of my house in the morning to go to work, I use 20 products. Whoa. Right? Soap. Shaving cream. Shampoo. Conditioner. Body wash. Body lotion. Deodorant. Sun block. Foundation. Blush. Lipstick. Lip gloss. Eye shadow. Eye liner. Mascara. Loose powder. Hair straightening cream. Hair spray. Hair shine infuser. Perfume. You’d think I am Miss America with the need to be so presentable. The truth is, as I’ve shared, I am a tax accountant. I sit at my desk all day surrounded by spreadsheets and adding machine tape stuck to my windows to track projects. Nobody in my office cares what I look like. Most days, the only time I speak is when I sing along to Pandora. I care what I look like but spending a fortune on beauty products and wasting the Earth’s resources and energy to be as unnatural as possible? It makes no sense. So what’s a vain me to do? A few months ago, I researched chemical free and natural skincare/haircare. I never used ANYTHING tested on animals yet the stuff I used on my own head was toxic. I quickly learned that makeup is made up of several Toxic Metals which include the following: Trienthanolamine, Sodium Laureth Sulfate, Quaternium-15, Propylene Glycol Petrolatum, p-Hydroxybenzoic Acid Benzyl Esther, Nitrosamines, l-Naphthol and 2- Naphthol, Mineral oil, Lanolin, Hexamenthylenetetramine, Formaldehyde, Bronopol, and Mercury. I don’t know about you, but I can’t say those words… yet I was putting this stuff on my body. Here is a fact: woman who wear makeup on a daily basis can absorb almost five pounds of chemicals into their bodies each year. It has been proven that when chemicals are absorbed in the skin they are also absorbed directly into the blood stream. These five pounds of chemical intake from makeup each year has been stated to flow directly to several delicate and fragile organs. Health effects may include brain and learning disorders, vomiting, skin rash, cramps, mouth sores, etc. I’ve made the switch to use more natural brands and purchase products which use less of the Earth’s resources. Sometimes, my decision is based on something as simple as packaging. If there was cardboard, plastics and extra materials used to “sell me” I don’t buy it because I don’t want to pay extra for the extra fancy package. So now it’s your turn. How many products do YOU use? 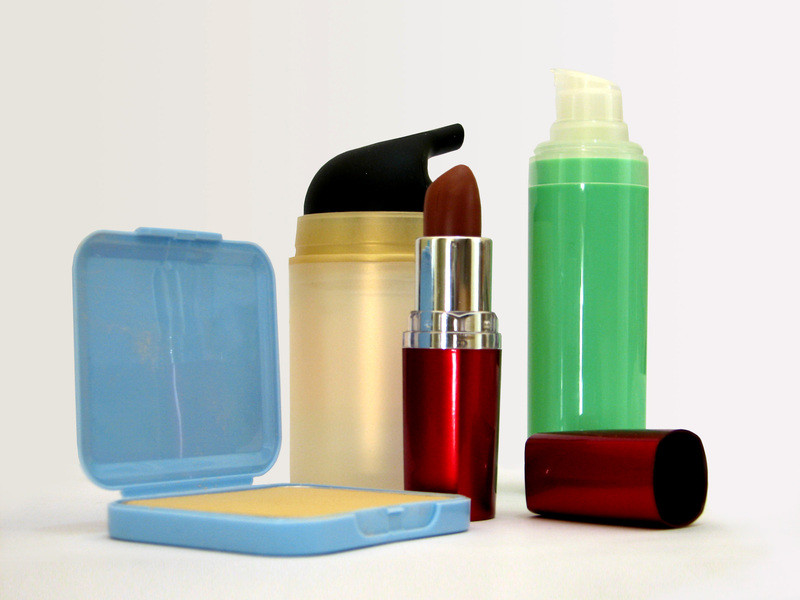 EWG’s Skin Deep, Cosmestic Safety Database. You can enter a product name and find out if you should be concerned with the contents and why. The Story of Cosmetics – please take the time to watch the video!